Earlier this year I read of a marriage hastily, and later regretfully, made. It was between Isabel Archer and Mr. Osmond in Henry James’ The Portrait of a Lady. Now, George Eliot gives me Dorothea Brooke and Mr. Casaubon in her novel, Middlemarch. Both marriages seem doomed from the moment we learn they are to take place. I asked my friend Gretchen why Dorothea married Mr. Casaubon when I first began this novel. Why would a beautiful and charming young woman become entranced by a man with eyes in deep-sockets who resembled a portrait of Locke? It seems she thought he possessed a deep mind, containing profound thoughts, and she believed she could assist him as he laboriously studied and wrote his papers. He never seems to take into account Dorothea’s happiness, or her heart, and I continue reading this novel with dread for her future. Even though I became rather bogged down around page 581, I’m awfully glad that Nymeth suggested a read of the novel Middlemarch. 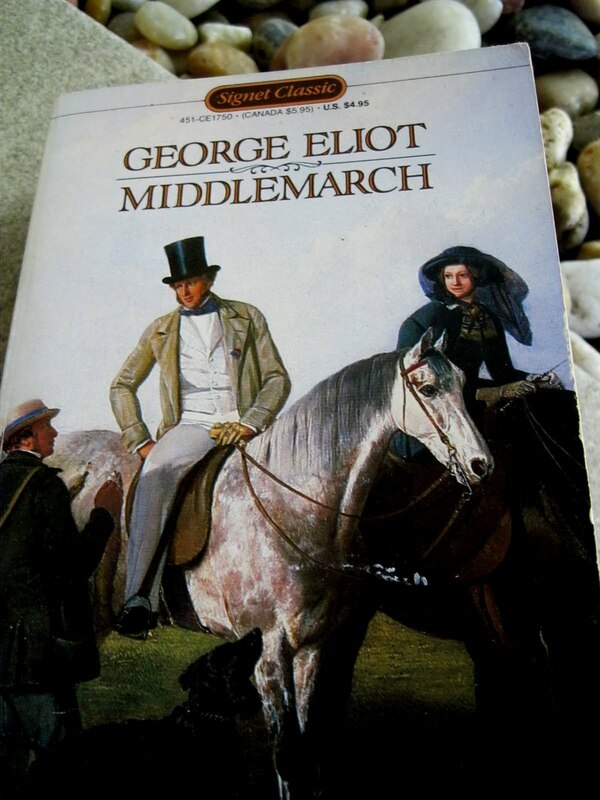 It’s the first time I’ve read anything by George Eliot, and it’s the first time I’ve opened Middlemarch‘s pages, although it’s one of my best friend’s favorite series on PBS. Indeed, reading this book was much like the experience I had watching the Austen series last winter: one of longing for times past and an afternoon tea with some of the more endearing characters. Principal to the story are Dorothea Brooke, who made an unhappy marriage for herself in marrying Mr. Casaubon, and Lydgate who married the beautiful Rosamunde Vincy. Also appearing are Will Ladislaw, Casaubon’s cousin who falls in love with Dorothea, Fred Vincy who loves Mary Garth, and Caleb Garth, her father, whose integrity made him my favorite character of all.